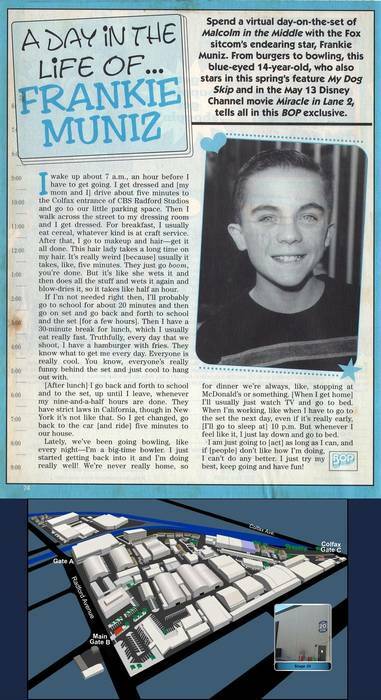 In this really interesting article, Frankie describes a typical day of filming Malcolm in the Middle at the CBS Radford Studios, Studio City, California. He describes how his mother drives him to the Colfax entrance of the lot, and that's why I included a map of the studios at the bottom, which shows that the Colfax gate is close to Soundstage 20 (highlighted), where the interior scenes at the Wilkersons' house were filmed. Article scan by tjpeople from a fan's scrapbook.